The fourth day of the fuel tax protests in France and several gas stations are indeed running out of petrol to sell. Meanwhile, some groups of protesters have started also attacking toll booths, police made multiple arrests and oppositions politicians are calling upon President Macron to respond. In the Gironde region, the protest turned violent when a group of so-called gilets jaunes (yellow vests) decided to burn down the local toll booths. France’s highways are quite expensive and the anger of motorists is not only over the rise of fuel and petrol prices but also over driving in general becoming more expensive. Over the summer, the government of Mr Macron applied lower speed limits on the alternative routes (without toll) leading to massive speeding fines for many French families going on vacation. The French Minister of Home Affairs Mr Christophe Castaner meanwhile blasted the movement of the yellow vests, which in France and French-speaking Belgium protests against the high fuel prices. "We see today that a movement, which began in a friendly atmosphere on Saturday, has gotten totally adrift," Mr Castaner said on state television France 2. "One sees radicalization with demands that are not coherent, going in all directions." The actions continue today both on the French motorways and near fuel depots. So far, the protests have resulted in one dead and 528 wounded, of whom 17 remain in hospital. 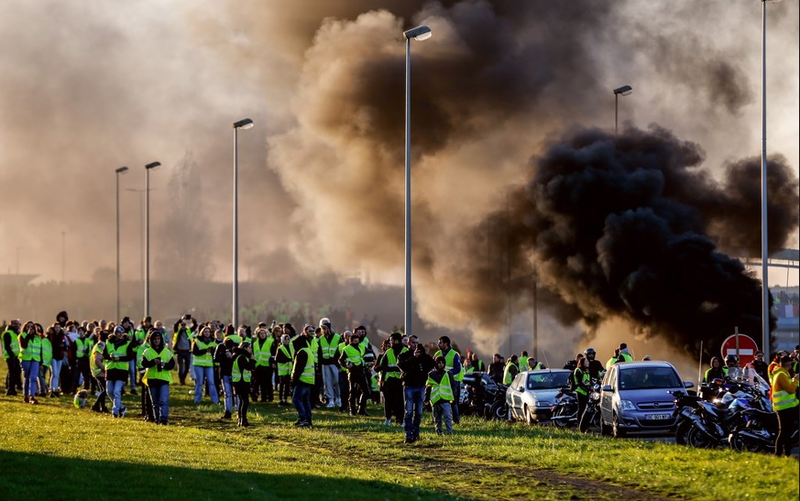 Related coverage: <a href="https://thegoldwater.com/news/42773-France-Fuel-Tax-Protests-Continue-For-Third-Day-Video#42794"> France - Fuel Tax Protests Continue For Third Day (Video)</a>. Mr Castaner referred in the interview to three police officers who were injured when they were pelted with pétanque balls, and the intervention that was needed last night in a shopping center in Langueux. There the security forces had to intervene against men "who had iron bars and Molotov cocktails". Former President Hollande meanwhile urged his successor Macron to answer to the demands of the protesters before things get out of hand, simply by acknowledging that they will be heard. The Presidential couple has chosen to go on a tour of Europe while their country is blocked, visiting Germany and Belgium for the time being.